Below is what my circuit looks like. Below is the very simple code. I was expecting my LED to not be lighted as its a 0% duty cycle. I even change the pinNine outputValue to (64, 127, etc) but for some reason the LED is always lighted. Any ideas? It seems extremely likely that you have a hardware problem of some sort. If you have a voltmeter you can try these easy checks. I carried these out to be sure that I got what was expected and the results are as you would expect them to me. Use a meter set to DC Volts - typical common meter circuitry averages the PWM well. Remove LED etc connection to pin 9. Measure the voltage from the 5V pin to ground. If powered from USB this will usually be slightly below 5V. Measure the voltage on pin 9 relative to ground. It should be close tohalf the voltage on the 5V pin in 1. above. This is because the analogWrite value is controlled by PWM with values from 0 to 255. 128/255 ~= 50% so output is 50% of Vref = 5V by default. in a 5V system. The voltage on pin9 should be about 10% of the voltage on the 5V pin. IF you get approximately the voltages shown in 3. and 5. your code is working OK and your hardware is OK. If not then 'summat aglae'. Check that the red wire to the LED goes to UNO ground. The voltmeter is a surer way of checking that the LED is as you can see actual numeric values that result. It always helps greatly if you show PIN IDs on photos so people can be confident re what you have done. If you view the whole UNO-R2-R3 connector with numbering it is obvious that the important pinouts are the same. If however you view part of the connector with no numbering/ pin names shown, then on the R3 there are additional pins on the ARef end of the connector which make comparisons'more difficult). It would help if you gave actual model and weblink in future "just in case it matters". .
You appear to have connected to pin 9 (as you intended to) Pin 9 has PWM capability, as required. It seems that your code should work. IF the red wire connects to ground the circuit seems electrically correct. 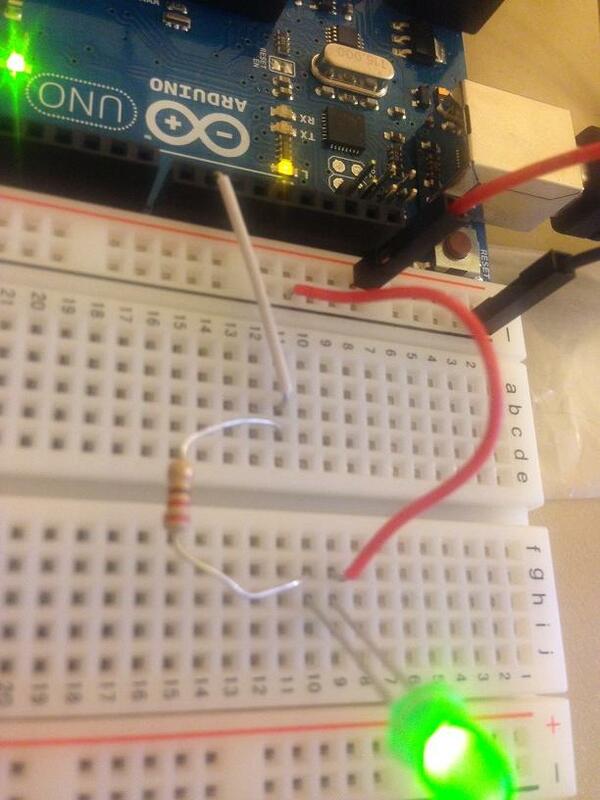 Try digital write on / off on pin 9 to see if LED changes and that the port behaves as expected. A bad port pin is possible. What pin is serial on? Try another pin with PWM capability to see if it changes. The connector pinouts vary widely between models of UNO. Flat side of LED is -. This means that your white wire is on - side and your red wire on + side. Therefore your power rail connection is reversed... and therefore your LED is ON when you send 0 on PWM. By the way, you will set the LED OFF by writing 255 on PWM. Solution: connect power rails correctly and everything will be back to normal. Remove pinMode(pinNine, OUTPUT), this is only used for digitalWrite(), the PWM controller might be affected by this. Other than that, your sketch seems to be correct. I assume the black wire in the breadboard is wired to Ground, correct? Ok, it seems my understanding of the PWM was wrong. 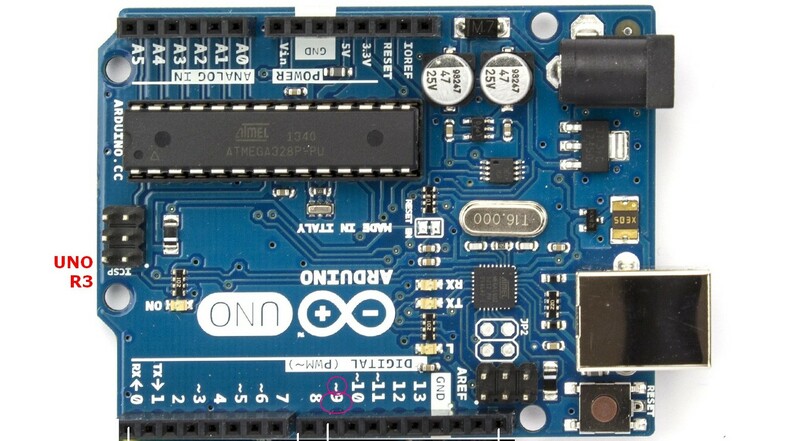 I tried the circuit and code from here (http://arduino.cc/en/Tutorial/Fade) and it worked as expected (fade in and out). Actually when i wrote my original code i was expecting the LED to blink. So, as i got closer to 255 i was expecting it to spend more time being 'lit', as compared to 0 where it should spend less time being 'lit'. I even change the pinNine outputValue to (64, 127, etc) but for some reason the LED is always lighted. It being lighted makes sense. What i missed out was it being dimmer when the value was lower. Not the answer you're looking for? Browse other questions tagged pwm analogwrite or ask your own question.